Sidney Shows the White Feather. Notwithstanding his pronounced leaning towards a hard bald literalism, Mr. Rigdon was in the best odor of Disciple orthodoxy. The literalistic craze was everywhere so abundant in their ranks that the special display which he contrived to make of it was not seriously regarded. He stood among the foremost worthies of his sect. Even as late as the 5th of April 1830. the day before Smith succeded in establishing the "Church of Christ." Mr. Campbell mentions Sidney with honor in the company of Scott and Bentley; this trio of excellent spirits had enacted marvels in the Western Reserve (Mill. Harb., 1830, p. 147). There was no question whatever touching his prominent position and influence; not till after the date of his public defection from the Disciples was any kind of evil spoken or suspected against his gifts and graces (Richardson, Memoirs of Alexander Campbell, vol. ii. p. 344). wont to do, and religion was the subject of their discourse. Rigdon took occasion to remark that it was time for a new religion to spring up, that 'mankind were all ripe and ready for it.' Rosa thought he alluded to the Campbellite doctrine; but was soon undeceived by Rigdon, who remarked that it would not be long before something would make its appearance. He added that he thought of going to Pennsylvania, and that he should be absent for some months; but that the time would depend upon circumstances. The Doctor was much surprised by this conversation, as Rigdon was at that time a very popular preacher in his own denomination" (Caswell, Prophet of the Nineteenth Century, London 1843, pp. 58-59). Smith, Jun., Oliver Cowdery and John Whitmer. It bears [the] date July 1830, and instructs them, "Behold, I say unto you that you shall let your time be devoted to the study of the scriptures, and to preaching, and to confirming the church at Colesville, and to performing your labors on the land, such as is required, until after you shall go to the west to hold the next conference; and then it shall be made known what you shall do." Smith is believed to have obtained a number of revelations which have never been conveyed to the knowledge of the world in print; the Book of Doctrine and Covenants, even in the edition supplied by Mr. Orson Pratt, does not set down the whole of them. This is clear from the circumstance that the revelation directed to Emma Smith was originally designated the "27th Commandment, to Emma, my daughter in Zion" (Howe, p. 181); while in Pratt's edition it is set down as Section 25. Furthermore the title page of the edition that was printed in the year 1835 admits that a selection was made. This title page reads as follows: "Doctrine and Covenants of the Church of the Latter day Saints; carefully compiled from the Revelations of God, by Joseph Smith, jr., Oliver Cowdery, Sidney Rigdon, Frederick G. Williams, (Presiding Elders of the Church) Proprietors, Kirtland, Ohio, 1835" (Kidder, Mormonism and the Mormons, N.Y., 1842, p. 6). plain a story regarding the previous intimate connection between "the east" and "the west," and between himself and Sidney. However, the historian must bless the stupidity which led to an oversight that is of so much advantage to his researches. It is believed to have been the plan of Mr. Rigdon to bring Joseph forward at the approaching session of the Mahoning Association, which was appointed to convene at Austintown, Mahoning county, Ohio (Hayden, p. 295). The meeting usually embraced the last Sunday in August, which this year fell on the 29th day of the month. Here Joseph would have encountered Alexander Campbell in person, and it might have been highly interesting to witness the conflict between the pair. Mr. Smith had been instructed to have himself in readiness to take leave of Harmony, Pennsylvania as early as Friday the 20th of August; they were to reach Colesville in Broome county, N.Y. on Saturday the 21st, and traveling by way of Fayette and Manchester they might expect to arrive at Austintown as early as Saturday the 28th of the month, or even before that date. But the prophet was prevented from keeping the engagement he had formed with the believers in Colesville on Saturday the 21st of August, and wrote to excuse his failure on the ground that "the conveyance in which he intended to make the journey did not arrive from 'the west;' and the distance was too great to walk." (Newel Knight, as above, p. 63). It is fortunate that Newel Knight's Journal contains this single line of reference to the project of migration towards "the west" in the month of August 1830, thereby supplying a confirmation of the allusion to "the west" that was given in the prophet's revelation from Harmony (D&C, 26:1). But Sidney could not screw up his courage to the sticking place; as the time for the meeting of [the] Mahoning Association drew nigh the perils and the terrors of a decisive conflict with Mr. Campbell were highly magnified in his fancy; he was never brave except on parade; the entire scheme of fetching Joseph to "the west" was abandoned. Sidney went to the Association in his own private company, where instead of the pitched battle which he had planned for the occasion, he must content himself with a mere skirmish in favor of the "ancient order of things" as regards the community of goods (Hayden, pp. 298-299), with implied reference to the community of seventeen who were organized under the lead of Isaac Morely in his church at Kirtland (Hayden, p. 211). It has already been signified how when he was defeated in that half-hearted encounter he retired from the scene in disorder, and poured out his disgust into the ear of Benajah Austin in Warren (Hayden, p. 299). If Joseph Smith had been on the field at Austintown, it is possible he could have carried the day. of averting this danger Sidney appears to have had recourse to the sympathy and devotion of Mr. Parley P. Pratt. Parley Parker Pratt was born on the 12th of April 1807 in the township of Burlington, Otsego county, New York (Tullidge, Life of Brigham Young, New York, 1876; Supplement, p. 75). Being of the strictest Puritan extraction his family had come from New England to New York (Tullidge, Life of Joseph Smith, p. 95). In the month of October 1826, when he was in the 20th year of his age, he left his home in New York to try his fortunes in the West. Passing through Rochester, he is credited with having there exhibited his religious turn of mind by laying out most of the money that remained in his purse, to make an investment in a small pocket copy of the Bible. From Rochester his journey was laid to Buffalo, where finding that his money was now all exhausted, he engaged to work his passage on a vessel as far as Detroit, Michigan. Becoming weary of the bargain he went ashore at a small settlement, possibly Lorain, about thirty miles to the west of the city of Cleveland, and established himself as a resident of Lorain county. Clearing a farm of forest land, during the winter and spring, he was able to return to his place in New York during the summer of 1827, where he obtained a wife who was willing to share with him the hardships of his Ohio existence. months, when in the summer of 1829, Mr. Rigdon appeared in company with Mr. Clapp of Mentor, bearing the brand-new "ancient gospel," with many transports. Sidney laid siege at Elyria, where he soon had the fortune to establish an interest which in 1832 was organized into a church (Hayden, p. 467). Going from that point across to Birmingham in Erie county, the like success awaited him. Under his influence the Rev. Orrin Abbott, pastor of a Baptist church at Henrietta, midway between Elvira and Birmingham, and but a short distance from Amherst, was enabled to lead his flock into the Disciple fold (Hayden, p. 465). Parley P. Pratt the young farmer, who is also said to have been engaged in teaching school was the very man to attract the notice of Sidney, who would cheerfully give him to understand the exact meaning of that small pocket Bible which he had purchased at so much sacrifice in Rochester. Tullidge affirms that Mr. Rigdon's "preaching so attracted yoing Parley that he united with him as a sort of apostolic compeer" (Life of Joseph Smith, p. 96). Those were days in which the world seemed to be at the height of spring time, and the heavens had descended to commune with mortals. the coming of the Messiah, and the glory that should follow. I was so astonished at the darkness of myself and mankind on these subjects that I could exclaim with the prophet, surely 'darkness covers the earth, and gross darkness the people.'" It may be presumed that Rigdon perceived and enjoyed the fine frenzy to which the spirit of his youthful "apostolic compeer" had been now wrought up. Possibly a special visit he paid to Parley in the beginning of 1830 may have had some relation with this extraordinary enthusiasm. Accordingly when in the month of August 1830 he was in need of an instrument to do service to the "kingdom," Parley would be highly amenable to his wink; Mrs. Pratt would likewise be desirous to visit her kindred in the state of New York, and it would be just in ordfer for Parley to turn aside at Rochester, and to communicate with the "church of Christ." To be sure he gives the public to understand that he was "impelled by the Spirit" to perform this mission, but it is not difficult to lift that veil and to discern the truth that lies behind it; his way-bill was probably laid down before be began the journey, and it is possible he was supplied with letters of introduction, if indeed any such precaution was required. in later Mormon annals; his host at this moment was a certain Mr. Wells, who might have been in some fashion connected with Lorenzo Wells, and Daniel H. Wells, who were subsequently prominent figures among the Mormons (Tullidge, p. 97). As soon as he got sight of the Book of Mormon his conversation which must g=have been duly cut and dried in advance, immediately immediately began to be prominent and intense. He was bent on the purpose of obtaining the personal acquaintance of the prophet, concerning whom he may have received the best accounts from Sidney. Setting forth to find the cabin of Hyrum Smith, he was welcome there by that gentleman, and passed the night in conference touching the interests of the kingdom. him to all the duties and functions of the office of Elder, or Apostle (Tullidge, p. 98). Parley was much disappointed by the absence of the prophet in Pennsylvania (Tullidge, p. 97), but he made the best of the case, and went on his way to join his wife, who had proceeded alone from the point where they separated to the home of the Pratts, which at this time was situated not, as formerly, in Otsego county, but farther to the East, in Columbia county (Reynolds, Myth of Manuscript Found, p. 32). Mr. Pratt in his own account of these transactions is not in every point a reliable historian; for example he says he embraced Mormonism in September 1830, but if that had been the case he would have encountered Joseph at Fayette, and would have been present at the second conference. He further deposes that he began his famous journey to the west about the 15th of October. On his arrival at his early home sometime during the month of September, Parley began to propagate the new tenets, and with distinguished success, at least in the person of his brother Orson, he won a convert who subsequently became one of the strong pillars of the Mormon "kingdom." Orson Pratt was younger than Parley, by more than four years, having been born in Hartford township, Washington county, New York on the 19th of September 1811 (Tullidge, Life of Nrigham Young, Supplement, p. 74). 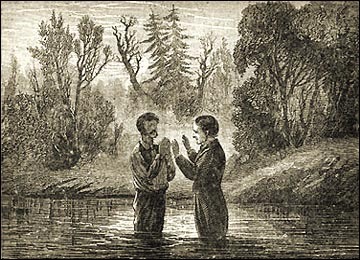 The baptism of yoing Orson Pratt took place on his 19th birthday, namely the 19th of September 1830, in the township of Canaan, Columbia county, New York. (Tullidge, Life of Joseph Smith, p. 107). Though Mr. Rigdon had shown the white feather as distinctly as possible, by omitting to arrive at Harmony with the conveyance which Joseph confidently expected from out of "the west," he had yet supplied a guarantee of his honesty of conviction and good faith by sending Parley P. Pratt in the place of it. The intense heat of Parley's devotion, the entire earnestness with which he gave up himself to the cause, was a clear proof that Mr. Rigdon was not playing a traitorous part. Therefore the intimate relations which had existed up to this point between the two leaders of the enterprise, were relieved from the strain which must have been laid upon them in case Mr. Pratt had been willing to step into the breach and sacrifice himself to the interests of peace and progress. It was still possible for Mr. Rigdon to trim his conveyance and come and carry Joseph to "the west," but it is more than likely he had given up that exploit from the moment when he was successful in obtaining the services of Mr. Pratt to go to New York. It is believed that Parley signified to his Mormon brethren immediately upon his baptism in August 1830 the necessity which Rigdon experienced to alter his scheme, and suggested the main outlines of the plan he now proposed to employ in order to transfer Joseph to "the west." That plan was for Mr. Smith to send certain persons from New York to go through the form of converting Sidney and his church at Kirtland; when this task had been happily accomplished it would be perfectly natural for Joseph to show himself in Kirtland; if he came without observing that kind of precaution his presence might excite a degree of opposition that would almost infallibly defeat the end after which they had been so long striving. receiving the advantages of any more special introduction to it than such as Sidney had got courage enough to impart by the dark hints he had let in the course of private conversation. He was a born coward; sure to fail in the pinch of peril. As soon as Sidney's suggestion made through Parley, had come to the attention of Joseph he began to provide for the execution of it. In the revelation conveyed to Oliver just before the meeting of the second conference on the first of September 1830, he enjoined as follows: "And now, behold I say unto you that you shall go to the Lamanites and preach my gospel unto them; and inasmuch as they receive thy teachings, thou shalt cause my church to be established among them, and thou shalt have revelations, but write them not by way of commandment" (D&C, 28:8). The example of Jesus in sending forth his followers by two and two, was already in his mind, although the prophet did not make any distinct arrangement to that effect until a later season (D&C, 42:6): he therefore procured a revelation during the progress of the conference commanding that Peter Whitmer, jun. should likewise go forth with Mr. Cowdery (D&C, 30:5). the missionaries resumed their journey, perhaps by means of a sailing vessel on the lake, the remaining distance of two hundred miles to the residence of Rigdon at Mentor, where they were received with cordiality and entertained with hospitality (Tullidge, p. 100). There can be little question that about a week of time was required to perform this journey; the party could have hardly arrived in Mentor before the 25th or 26th of October 1830. The assertion of Philo Dibble (Early Scenes of Church History, Salt Lake City 1882, p. 76), to the effect that he was baptized in Kirtland on the night of the 16th of October is almost certainly incorrect: the evidence is nearly incontestable that Pratt and his party were in Manchester, New York at that date. adhesion to the new evangel, it would be in order for him to make known his own conversion, which he could easily explain had been produced by testimonies that he found it impossible to resist. There can be no question that the business was handled with adroitness: the church at Kirtland got no suspicion of the sharp practice that was being played upon them. The first important success was celebrated in the baptism of the communistic family of seventeen persons under the government of Isaac Morely. Pratt and Cowdery came forward with very honeyed words to speak in the ears of this company; Howe says, "they professed to rejoice at finding a people walking according to the scriptures, and pretended [themselves] to acknowledge no other guide. They professed to have no commands for them; nevertheless, they called upon them to receive the book as from Heaven" (Howe, p. 103). But in connection with this silver speech they encountered a difficulty; Joseph had distinctly prescribed that every person who wished to enter the "Church of Christ" should submit to re-baptism. (D&C, Sect. 22). Confessedly these persons had the same doctrines as the Mormons' they had been baptized with the same baptism, namely immersion for the remission of sins and the gift of the Holy Spirit, and it was not easy to perceive that they required anything farther. Oliver and Parley, however, soon convinced them that the baptism they had in charge would enable those who received it to work miracles. Directly (after) they of heard of miracles they were eager to submit, and solicited the new immersion with enthusiasm; in fact they found it impossible to get on without it. This expedient to evade an obstacle that from a Disciple point of view might have been insurmountable, was likely suggested by Sidney, and the conspirators must have chuckled famously over the admirable success which was thereby achieved. But to save appearances Mr. Rigdon, when he was informed that the whole seventeen members of Isaac Morely's communistic family had been re-immersed in a single night, "seemed much displeased" (Howe, p. 103). When the missionaries showed themselves at his house the next day, he called them to account for the act of immersing people for any other design than for the remission of sins. These in their turn allowed that the one Sidney had stated was the only proper design for baptism, but excused their solicitation of the persons in question. of everybody who might have had occasion to be offended with any part of his former life; he forgave all who had persecuted or injured him in any manner, and the next morning, himself and wife were baptized by Elder O. Cowdery" (Myth of the Manuscript Found, p. 33). The above great occasion probably fell on Sunday morning the 7th of November, and the baptism of Rigdon on Monday morning the 8th; at least Joseph Smith seems to indicate that Rigdon held out for about two weeks after the missionaries from New York entered Kirtland (Tullidge, p. 104). Pratt and his colleagues remained another week on the ground -- three weeks in all -- during which time they succeeded in baptizing one hundred and twenty-seven souls (Tullidge, p. 101). who would be delighted by means of this kind to make a formidable rival bite the dust. It was never in the power of Mr. Rigdon to retrieve the loss that [accorded] from such an unhappy disaster. Say what he might and do what he would, it was clear to the mind of every believing member of the "Church of Christ" that Joseph stood at its head by divine right; his position was paramount, while that of the man who had hatched the whole enterprise and given it shape was clearly to be recognized as an inferior of the humble tool he had selected merely to give him aid in conducting some of the minor details of it.